NOTE: This TAS WON'T sync unless these steps are followed due to save file issues with DesMuMe! A survival horror game that stars a mental patient trying to find his way out. Being genre savvy, the protagonists realizes carrying a ton of guns goes against the concept of "horror", so most of the items are skipped. This TAS originally started at 2011, but due to numerous setbacks such as constant new discoveries it was delayed by 4 years. I wanted to do a 100%, but for some reason I can't locate 2 of the maps in Chapters 2 and 14 so I scrapped that idea. Not exactly related to this room, but during the beginning, you can press "Start" 1 frame before lag occurs to immediately go to file select. I made small turns here, but it didn't go fast enough to save any frames compared to sharp turns. Pressing "Start" (and other menus) is possible during the fadeout after examing anything, but often, all it does it bring up the menus without any effect. 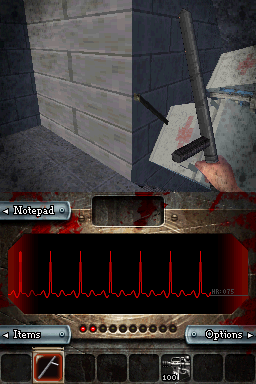 The notepad was one of the areas where the game can be fooled into skipping the writing "tutorial". Turning twice (once at the very start and then again a bit before the cutscene) is faster than turning only once. I made a sudden 180 turn before the cutscene solely for entertainment purposes; It doesn't affect the time whatsoever. The password is deterministic, so the challenge instead becomes typing "081399" as fast as possible. While the game allows using both the traditional buttons along with the touch screen simultaneously, it seems that tends to cause buttons to get "stuck", causing them to get pressed along with other buttons. This crashes the game after too many buttons are "pressed", so I had to be careful. Oh, and the I skip the flashlight because Vault despite the game's continued insistence. If anyone wonders why I swung the night stick for seemingly no reason, it's because if I don't, the game would stop me with a screen that basically tells me to press "L" to swing. 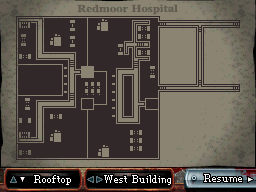 The map is located in this room, but it's not essential. This room could actually be improved by RNG; if a zombie spawned in front of me, AND at the same time manages to get up while I walk past it AND move to me, it'll push me slightly forward, saving 1-2 frames. Since there's 3 zombies, up to 6 frames or so could be gained from this room under optimal luck, but when I got that, it messed up the RNG for later events. This type of room appears over and over throughout the run, but for some reason, copy-pasting input for the turning tends to give suboptimal results. The same applies for the stairwells; the input must be adjusted a bit for every single one of them or you'll lose a frame or so. The hitbox for this type of door at the end I swear changes a bit every single occurance later. Doing sharp turns ends up faster here than turning gradually. Also, directly copying input from this section to future stairs tends to mess up the angle for some reason. The flashlight appears yet again; I ignore it once again. It was here that I discovered that the RNG is determined by the clock. Delaying frames turned out to be a very bad way to manipulate enemies the majority of the time, so I instead opted to change the start time. The zombies here were curiously one of the 2 places that really needed luck to save a lot of time. The first zombie had a terrible spawn location this time, and the last zombie almost messed me up, but it's worth it just to get a better zombie spawn later next chapter. Of course an even better situation would be having all the zombies here out of the way, with the last one further to the left, but unless someone finds the RNG address and ways to predict the clock's influence, then that won't be happening. I skipped the gun because the cutscene for the room it's in kills off any benefit that having a gun may give. 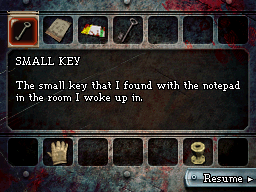 I never managed to locate it in game other than the use of cheats to unlock it despite this chapter consists of only 3 rooms. There's 3 zombies here that will burst out from the rooms; the first 2 can either spawn from the left or right, while the last always spawn from the right. An improvement will be to have the first 2 spawn at the right, so I only need to turn twice. Also, I have no idea where did the little girl go; the section to the left where she ran is unrendered after a bit, so for all I know she simply vanished from existence. That drawer near the door made this room more annoying than it needed to be. There's 2 zombies in this room. One will spawn in the closets, and the other will in front near the closets, to the right, or inside another closet. Having it spawn anywhere but to the right is enough to make this room optimal, After that, every other "bad" RNG seemed to not affect the time too much. Due to my lack of knowledge on locating (and lack of processing power to brute force it) this was the last chapter and room I used the system time to affect. The map is in this room on the couch. The flag for whether worms should spawn in this, and the next few rooms seems to be simply a check for if you have the yellow card key. In case anyone wonders, I can't clip into the next room shown through the glass since that's actually part of the current room and the doors shown won't work. No comment until I come back later. For the piano, apparently I can play "DEAD" without ever lifting the stylus. Pressing the menu does not fool the game for this part. It might look like the worms spawn after the cutscene, but if I used cheats to obtain the card key without ever entering the piano room the worms would already appear. With the worm now, it's possible to go out of bounds here. However, like I mentioned before, that gives no benefit for this room since the door still needs to be entered to load room 4. I wasted some frames to avoid a worm because I need health to do a major skip next chapter. Every single yellow door stops you from running and forces you to build speed back again next room. After this room, the worm spawns are not determined by the card key's flag. The route I used here, barring a new clip glitch, is optimal. The zombies could've spawned in the middle of the road, so I was quite lucky this time it didn't. The worms and 1 zombie that spawn here curiously don't exist until the cutscene is triggered. The table near the start could actually be used to clip out, but I need the worms to push me out, so unless someone finds a way to do so without the worms then the cutscene can't be skipped. The zombies appear in the closets to the right and left. Luckily, most of them never appeared on the right this time, and the one that did was far enough inside so I made it through perfectly. I'm not sure if it would be faster if the worm dropped earlier to push me since I needed health for later. Turning a bit at the bed near the end does not save time. A zombie appears right in front of me, but it's completely avoidable. I had horrible RNG for the banshee spawns, so I had to turn to kill them. The optimal spawn points would've allowed me to kill them without turning for them. I grab health now because tanking the hits from the banshee next room is faster than making a sharp 180 turn for 1 frame to hit them 2+ times. I never managed to get the banshee to spawn to my left; I'm not even sure if it ever does. If it could, I wouldn't need to suffer 4 damage. 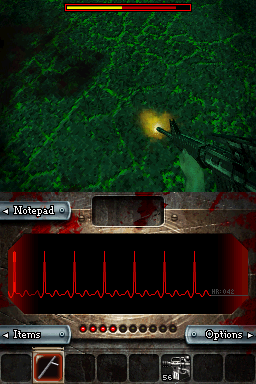 But seriously, this chapter was one of the major "blocks" for this game; there's a number of zombies later that really messes the run if they spawned at certain spots. I already knew from my experience with chapter 6 that this game reuses rooms if they are revisted; I was able to confirm through the use of cheats that the elevator for this chapter functions even at start before the cutscene. However, clipping into it was the tricky part. If I had used the blocks in front of me after the cutscene, the elevator door would be locked until the boss is dead. After messing around, I found out the debris I used here at the left of the entrance can clip me out of bounds with the help of worms, so I triggered the worms as soon as possible and tried to get out. The worms spawn at a certain point as seen in the run, but that spot is part of the rather large cutscene trigger, so I had to let said cutscene play to get there. The clip could be improved into having the worms only hit me once, but I haven't managed to get that to happen for this spot. I know it's possible though, since a clip at chapter 15 does exactly just that. Oh, and since I never fought the boss, if I were to return to this floor using the elevator, the door would still be locked. The door would be shown as open, but I can't walk out the lift. Pretty straight-forward. I skipped the rifle because it ended up taking too long (2 minutes) for only 8 seconds saved later on. As you can tell by now, the game really wants you to pick up the flashlight no matter how nonessential it is. The tree has spots that forces you back to walk for some reason; I avoided those. The iron key MUST be picked up; the gate will not "magically" unlock itself when I revisit the courtyard at chapter 11. Also this skips the wheelchair man boss, so the first boss of the run is the mouths room. The clip itself is also one way, so to get back to the start, you have to do this chapter backwards. That's also incidentally the fastest way to obtain the buzz-saw in a 100%. The last banshee encountered is an example of a situation with perfect RNG for them. There's 2 washrooms to the right, but they serve no purpose for speedrunning, so moving on. The zombie spawned at a rather inconvenient location this time, but thankfully like I mentioned back in chapter 3 it is not of a concern. If I simply head straight, I technically could've skipped the machine gun by clipping in the room there, but then I would be completely screwed at the boss next chapter. In case anyone wonders, no, you cannot try to clip at the mouth boss to get to the door, since the door's locked. It's a storage room. The only thing notable is that the doors here are glitched up on the map. I could've also moved left and entered the room there to clip out and skip the machine gun, but as mentioned, it will mess me up next chapter if I did. I have honestly no idea why there's breathing noises here. There's nothing in this room, so I assume it's simply to scare the players. The zombie spawned at a very bad location here, but thankfully it could be stopped using the nightstick. The password is "321123". I attempted many times to use the dpad and A/B buttons, but it ended up crashing the game due to the issue mentioned in chapter 1. I grabbed the machine gun, and obtained 100 ammo. This turned out 20 ammo more than I actually need, but attempts to splice away it ended affecting the rest of the run. It still can end up saving less than a second however, so there's that for future attempts. This hall infested with screaming worms may be improveable by be being pushed further using them. Rooms like these makes TASing this much more tolerable. I let the last worm push me, but killed the first worm because it blocked me instead. There's a worm to the right that would hurt me, so I took the left path instead. I grabbed health here, since getting hit later is faster than deliberately avoiding all worms. I wasted 10 frames to avoid a green worm since I initially didn't manage to dodge almost all the worms during the mouth boss. Once again, I tried to splice that in without luck. I take the left route since it's faster than using the route ahead of me. Funnily, if I splice input from this room, and pasted back to this same exact room, chances are, it will be optimal, but if I recycled this input to a different but similar room, it would be 1 frame or so slower. The screaming thing spawned right in front of me, but it doesn't cost too much time. I grabbed the disc and leave. RNG messes with me once again by having the worm appear behind me when I retrace my steps. The temporary invincibility from being hit saves me health here. I had much better luck this time with the spawning; both of them were out of the way. The developers sure had fun making each room very slightly different. I got hurt this time. I'm not even sure if it's possible to avoid that worm. If you don't look down a bit, the option to examine won't show up. The cutscene doesn't appear skippable. I'm so sorry about the angles during the fight, but it seemed using the weapon swap glitch with a nightstick places the aim to the top right hand corner of the screen, so I had to stare at the floor to shoot the mouths. There's 20 mouths and each have 12 HP. They don't appear to have any weakpoints that allows triple the damage, so I'm forced to fire 80 bullets. Oh, an as a consequnce of the above, the boss will respawn if I left and re-entered this room from room 1 (but not from room 8). I grabbed the health here. If there were more convinent spots before I enter chapter 8 then this would not be necessary since the restart trick would've "healed" me. Got a really nice spawn this time with nothing in the way. Same with the above; I almost got hit by the worm. Zombies and then flies. I don't recall having the zombies here attack me, but in the case they did, the nightstick should be able to avoid them. I swat away a worm that dropped but somehow managed to avoid the last one. There's a lone zombie in the closet, but nothing much else to note. The door also has a rather large hitbox. Banshees now appear inside "normal" rooms as well. Thankfully this isn't the 32 HP green tipped one, so it's alright. This room appears insignificant, but it actually affects me 5 chapters later for reasons I can't figure at the moment. A zombie tries to ambush me from the left, but the nightstick held it off. By the way, the map is located at the door at the far right, but there's a lone zombie blocking it. I recall seeing it spawn elsewhere as well, so that's another annoyance to manipulate away in a 100%. I still can't reliably splice in this type of room. While the zombie spawned nicely (rather than in front of the second turn), the ambushes don't seem to be manipulateable. I can't seem to avoid the flies; they appear to have a rather large hitbox for their size. That, or maybe there's more than 1 overlapping each other. I think this room may be improveable somehow, but it eludes me. There's no other foes in this hall. I'm not sure if the flies could spawn further away from the side I'm no, but I never had it happen to me. In other words, I get hit again. I had to turn 64 units to activate the lever. It seems bad, and I suspect it may be improveable, but I can't find a way to do so. I have no idea why "If You Dare" is written in blood here considering how easy the next room is even in real time. For future runners, the green worms can actually spawn in the path I'm using. Also I have no idea why it uses the boss music when there's no boss. I grab the revolver since the next 2 bosses would take far too long with only the machine gun. The screeching spitter spawns at a terrible location, and the zombie at the closet to the right nearly hit me. For some reason, instead of doing so, it decided to use it's ranged attack. This saved my life. These rooms can go to hell. There's a map in this hallway that I ignore. The zombies here are all nice and quite. Amazing luck with the banshee. I'm not sure if those green worms are even avoidable under optimal RNG. I wasted 10 frames to avoid the flies because I need health. I encountered them out of the way before, so if I had better RNG 10 frames could've been saved. Backtracking to room 4 for some reason needs the card key. That's pretty much the only spot outside chapter 3 that needs it, and it's completely optional to do so. The spitter appeared in the middle of the road again, so thankfully the zombie to the right didn't attack me. Great luck with the zombie to the right; it can actually reach you. There's nothing in this room, but there's annoying laughter playing. I suspect another wierd scare tactic. There's 3 zombies on the floor that will get up when you walk over them, but I don't recall them waking up quick enough to actually push me forward. I may be wrong however. It's THAT type of room again, with bonus screeching. Thanks devs! I avoided the first worm to the left, but then got hit by the worm before the lift. This was why I wasted 10 frames back at room 4; I'll die otherwise. Funfact: to the right, there's some ammo across the blockade that cannot be reached without glitches or cheats. 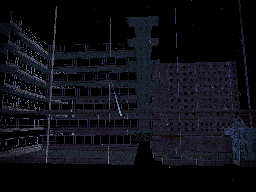 Did you know that they actually rendered the ENTIRE building during the courtyard? While attempting to go out of bounds will make you fall forever here, doing so at the top of the guard tower is perfectly fine for some reason. It makes for a nice view; if you had cheats to see it however. Oh, and since there's no flag for actually obtaining the 3 photos, you can actually enter the guard tower in chapter 5; there's no purpose gameplay-wise to re-assemble the picture, even in a 100%. The password never changes; it's 103107. But since getting the rifle is a waste of time, this chapter is basically filler and there's no real point in me talking about it. Well, except for the fact the elevator this time heads to a different floor. The flashlight is still on the floor as well. Also you cannot splice the input from chapter 5 due to desync. Despite the chapter's namesake, the cleaver is completely optional! Basically, they coded it as a normal NPC, so not only does it respawn like normal foes when you reenter the room, but also the door won't be locked! This trick is so obscure that even at the time of writing the fastest runs don't utilize it. Also note the lack of boss music here. I grab health now as I get hit 2 rooms later. They reused the card key door, but it doesn't require one now. I get hit here. This is not the only room I take damage however. The hall here has 2 banshees. The map is also located here. This hallway is rather odd. This is not the only place a wrong warp occurs. 3 green tipped banshees appear here and 2 have to be fought. Due to poor luck, I had to slow down a bit to kill both of them. It is completely possible to kill them without slowing down though. A literal straight forward room. There's 2 green banshees here; one on each side of the table. I chosed the left one, but there doesn't seem to be any difference; choosing the right instead would've avoid the left, but I still needed to kill the right one instead. Since I have nothing much to say about this room, the next time it appears I'll note the amount of times it appeared so far. I sidesteped a bit to the left to avoid a zombie. Since actually moving to the left using the DPad slows your speed, I changed my angle a bit instead. Not sure if it's possible to have the spitters further away from the path, but even then, it appears to save no frames it they were. I was tempted to grab some health here, but it costed 50+ frames to do so, which isn't worth it. This had possibly the worst banshee luck so far. This still ended up better than using the machine gun. This hall contains machine gun ammo scattered in 2 places. Since the chapter 8 trick gave me more ammo, I skipped these. The second banshee doesn't seem to ever spawn to the right, so I had to bat it away. It takes too long to inflict 32 damage to it, so I used the nightstick to bat it away. Holding the stylus at the same spot for 2 frames doubles the turning angle, but since 180 degrees is 128 pixels and the screen width is 255 I ended up at a slight angle. The stylus must be on the button to move it, and the minium distance it needs to travel is 24 pixels. Changing the letters to the left takes less steps than the right. There's a minor glitch here that allows the notepad to be opened while walking around, but that makes me unable to open doors so it wasn't done. You can clip out of bounds in this room, but there's no reason to do so in a speedrun. I can't seem to skip the cutscene that triggers. 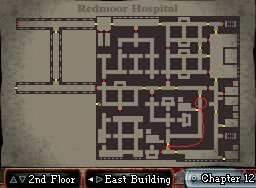 The map is located in room 4. This part was rather simple due to the lack of insects and drawers in the way. The spitters can actually get in the way in this hall. I got one of the worse spawns for one of the zombies, but the nightstick took care of it. While I can't seem to avoid the first worm, I evaded the next 2 worms by slowing down a bit. I needed health for a couple rooms later on. There's some flies here and magnum ammo, but I ignored both. I was forced to use the machine gun on the first banshee due to it's terrible placement. Coincidentally I had perfect RNG with the next banshee; it was also this room I discovered it's possible to inflict 32 damage without slowing down. The zombie being eaten can actually get up. The worms lower my health, and I can't see a way to avoid that. I'm pretty thankful the worm hit me, since that allowed me temporary invincibility to kill the banshees. It turns out at least 30 frames faster to kill than to avoid. I grabbed ammo in addition to health because the Wheelchair guy needed 8 bullets to die. I had 6. This situtation affects me again later. I actually managed to get him stuck at the corner after the 4th hit, but he inevitably left that spot after the 5th hit. If he could be stuck at the lefthand corner it would've saved me time from walking to the exit. I showcase a blindspot where I can see him but he's unable to shoot at me. The zombies were complacent during the TAS for this room. I believed that spitter costed me 2 frames or so, but I could be wrong and it being there may end up costing 0 frames. The flies at the middle can't reach me. I'm not certain if they even can actually. This white door's hitbox is further away for some reason, so I can't enter it from the side. Got lucky with the first banshee and I didn't want to mess it up with the second so I took the first door rather than the one to the left. The spitter at the center didn't cost much time at all. I'm uncertain if dealing with the banshee would be faster than avoiding the spitter. This room is like chapter 3 room 13 except it's the green variety. Still completely avoidable like before. I wonder why there's so many flies in a mental ward. Does no one care about hygiene or anything? This door has a rather large hitbox for whatever reason. It seems making a sharp turn is better than small turns for this particular room. This hall is evidence that it's completely possible to kill 2 green-tipped banshees without ever slowing down or turning. I honestly wished other rooms were like this, but regardless, I'm really happy about this part. Oh, and this is also the second chapter were a map exists, but for some reason I can't locate it. Does anyone know where it may be? I ignore the map on the desk. I was quite lucky that the swarm moved a bit so I could leave without getting hit. The zombie immediately in front of me could be whacked away. It's not required to kill it, so I left it alone. I got lucky and had the zombie spawned ahead of me rather than to the right. I got worse luck at the last zombie, but still got away and without using the nightstick. If a clip of some sort for the first blockade was found this room could be shortened. This clip was incredibly difficult to pull off. If I was 100 frames slower, it would've been faster to take the intended path. Not to mention these worms deal 2 damage per hit. I ignore the banshee here since it's not worth killing it due to it's location. I actually delayed 1 frame before leaving this room since it was one of the rare moments this method is worth. Oh, and don't try on future runs expecting this to work, since it was a rare almost-one-time thing. Due to my previous action, the left zombie noticed me later. It was enough for me to stun the other zombie and flee. I moved a bit to the right to avoid the zombie. It doesn't cost any time. The cutscene here can't be skipped. I took the magnum ammo here instead of the 2nd last room of next chapter, but I have the feeling it may be faster to do so at the 2nd last room instead. I had to smack the zombie away near the exit. There's zombies on both sides, so unless one or both of them was distracted, then I don't think it's possible to get through without swatting one. There's nothing here to attack me. Nothing's worth picking up as well. There's so many worms that it lags a bit. If I swapped to the machine gun earlier, it would've caused even more lag. This is also the last room I get hurt. Due to bad placement of both banshees I had to take out the machine gun. I didn't use the swap glitch since they were far enough for me to shoot safely. A familiar type of hall. Why is this even underground? Come to think of it, kinda ironic the one place that's bright is the only level that takes place underground. In fact it's even brighter than the courtyard. I managed to dispose of the banshee without resorting to gun violence. The RNG wasn't perfect however and I was forced to slow down slightly. I almost got hit the zombie to the left, but it instead pushed me a bit. It's quite nice that the green worms could be avoided without wasting time, since they would kill me. They also appear on the left side. I wasn't able to slash them away, so I used the machine gun and had every bullet fired land. I was able to slash the last survivor at least. The last enemy before the boss and its a swarm of flies. Ok. There's some pills right in front of me, but as a TAS, health at this point is not important. It's not like the boss has the ability to land a hit on me. The boss has 288 HP. Hitting anywhere while it grabs you acts as a critical hit, but hitting the glowing hand(s) doesn't cause start a cooldown. Because I needed an odd number of hits, I immediately struck him in the head and manipulated him to lift me 5 times. The trick at the end makes me skip the cutscene and reach the credits sooner. I could've done it later, but that won't allow the wrong warp at the end to play. See the game resources for tricks used along with addresses. With that said, I'm aware this TAS isn't perfect, but I checked, and almost all of the imperfections is due to crap RNG; the rooms themselves should be optimal for the most part given current known tricks. But for anyone who wants to tackle this game, changing the system time affects RNG, and not only does enemies change spawns, but also every single room has a chance of having more/less lag by intervals of 13 frames +/- 1. I do not know why this happens, but this should be accounted for if looking for a better RNG. Room 1 - clip out in 1 hit like in chapter 15. Also find out a better spot to clip out. Most of them are luck based, and therefore system time based. Also the +/- 13 frame thing potentially ruins the minor "have x push you" improvements. ars4326: Hello, jlun2. First off, congrats on finally getting this 4 year ongoing project completed! The tech quality shows, as evident in the streamlined routing and optimized item management. The Oob's clips were a nice addition as well, including the quickly-paced boss fights. With that stated, the run itself is quite limited in entertainment value, as it mostly consists of quickly running from one darkened area into another (although, again, it does have its moments, scattered about). Nonetheless, outstanding job on finishing this one! Accepting for publication to the Vault! Spikestuff: Site, you're not broken right? Right? Publishing.